A website that delivers online tutoring to students at the University of London by complementing physical lectures and tutorials held on campus. Quickienomics is a digital platform that consolidates e-learning content in the form of video explanations so students are able to learn at their own pace and at their own convenience. 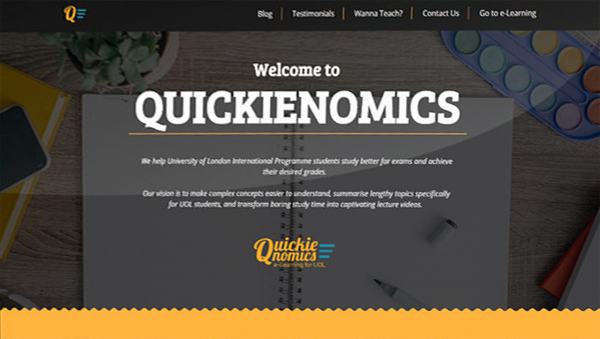 The Quickienomics website boasts a clean user interface design which enables students to easily navigate on the site to view or search for learning content by classes or chapters. With a simple and pleasing overall look and design, the website has been an excellent platform for students to learn outside of the classroom. The website was designed to be mobile responsive in order to ensure the best user experience on any screen size. This enables the platform to be a conducive part of the student’s learning journey.